When choosing a new heating system for your Nashville, TN home, it is important that you get one that will match the specific needs of your home. This means a heating system that is properly sized to match your home’s needs and one that is installed in such a way that you can rely on your system in the coming winter to provide reliable heating. 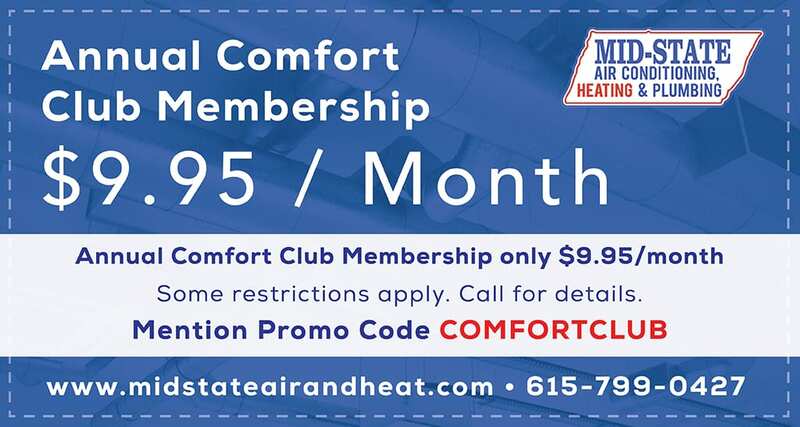 If you are interested in learning more about Mid–State Air Conditioning, Heating & Plumbing and our commitment to excellence, contact our Nashville, TN heating specialists today. 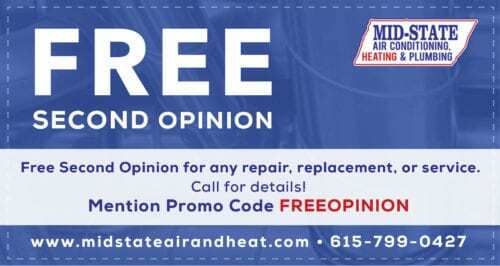 The first step in having a new heating system installed in your Middle Tennessee home is to determine what type of heating system you’d like to have. We offer installation services for all major brands and types of furnaces and heat pumps, so that we can match a specific type of heating to your home. Whether you need a new gas furnace, electric furnace, or heat pump, we offer a number of systems designed to match both your budget and heating needs. To ensure that the heat pump or furnace matches the size and layout of your home as well as your heating preferences, we’ll perform a thorough heat load calculation. 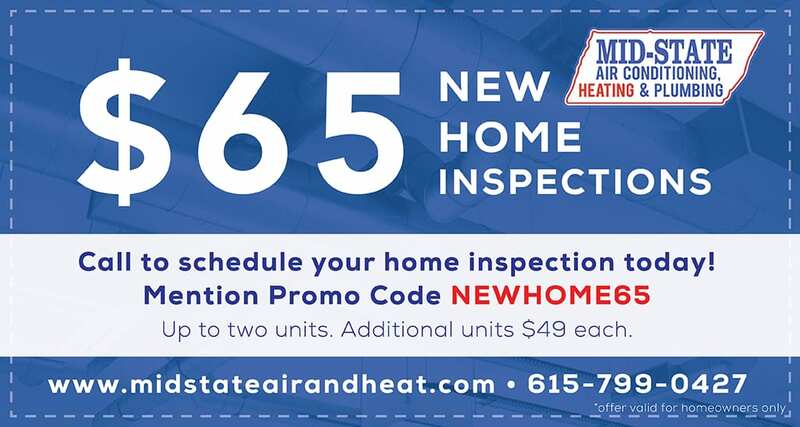 During this calculation we will inspect your Nashville, TN home and measure the total square footage that will be heated and any other components that may affect the total heating capacity of your new system. This will ensure that your heating system is neither too small nor too big, and that it operates properly throughout the year. Is Your Nashville, TN Home Ready for Heating Replacement? No matter how well–maintained your existing heating system is, there will come a time when it needs to be replaced. There are many benefits to replacing your heating system. To start, newer heating systems offer significantly higher efficiency ratings than older ones. For example, new gas furnaces offer AFUE ratings of up to 98%, which means they use 98% of the fuel they consume to produce heat for your home. That is as much as 50% better than systems created just 20 years ago. Another major benefit of replacing your existing heating system is that you’ll no longer need to have repairs performed just to keep it running. If your existing heating system is having problems on a regular basis, replacement is often less expensive than having someone visit and repair the system once or twice a year. 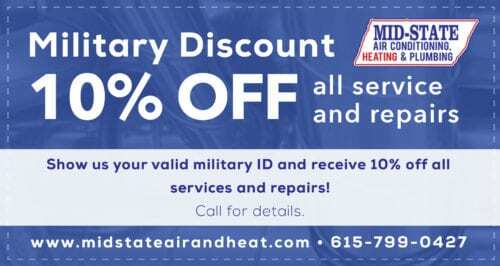 A good heating system is a must for anyone living in the Nashville, TN and Middle Tennessee area. To learn more about Mid–State Air Conditioning, Heating & Plumbing and all of our heating installation and replacement services in the region, contact us today and ask to talk with one of our Nashville, TN heating specialists. We will work with you to ensure the right system is installed in your home and that it works properly for years to come.